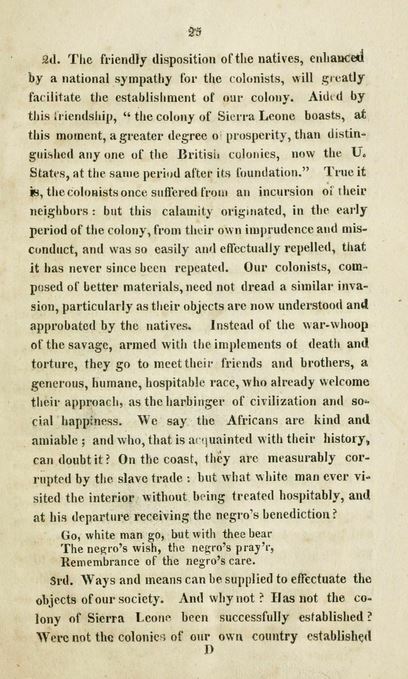 Picking-up from the post of July 15… today’s transcription covers 1) the willingness of colonists to be removed to the proposed colony, 2) the argument against the mindset of those who considered Africans as a lower race, and 3) various features of the new colony, demonstrating its suitability in climate and resources. A Quaker businessman, sea captain, abolitionist, and of both Aquinnah Wampanoag and West African Ashanti heritage. Image from Wikipedia (unsourced). But it is said the degraded negroes will not consent to be colonized, for to them slavery is a blessing. “Whom do they hope to persuade,” says the Haytian Baron De Vastey, “that slavery is a blessing? Is it us who have experienced all its horrors? If their declarations be sincere, why not put themselves in our place? Their example will have a far more powerful effect than all the absurd reasoning they can employ.” These are also the words of a descendant of Africa. Rely upon it, the Africans are not brutes, and therefore will return with joy to the land of their ancestors. This disposition has in fact been already evinced from one end of the U. 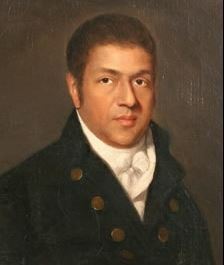 States to the other, and the Society, from the scantiness of its funds, is forced to reject thousands; and let it be remembered that of the thirty eight whom the lamented Paul Cuffee transported from Boston to Sierra Leone, at his own expense, there was not one disposed to return to America. Of nearly twelve hundred free blacks in Nova Scotia, only four or five refused to embark for Sierra Leone. How did you like that suggestion of owners and slaves trading places? When we see the mention of De Vastey and Paul Cuffee, are any readers surprised that Southerners could think such things? Does it compromise any stereotypes? For me, a modern device that may have reinforced stereotypes is the movie Twelve Years a Slave, in which, it seems, every white Southerner was, in some way, caught-up in the world of slavery (though the movie also served to bring our attention to that valuable story and the fact that, yes, those horrors did exist). While I realize some readers understand that this is not necessarily the case, I have read comments from others who think quite to the contrary. As I post these transcriptions, I really wonder how, Southerners portrayed under this light, challenge the thinking of those stuck on the stereotypes. In addition to our obligation to repair the injuries inflicted on Africa, we, in common with the rest of the world, owe here a debt of gratitude and veneration, as the original nursery of the arts and sciences from whence ancient Europe and Asia derived all that was valuable in architecture, poetry, painting, statuary, philosophy and government. The Egyptians (who were negroes according to Herodotus) were the instructors of Abraham and Moses. They were the astronomers and literati of Chaldea. Their pyramids, obelisks, mausoleum, and temple of Jupiter, have from the early periods of antiquity, and the two former to the present day, been considered the most stupendous monuments of human grandeur. Tarnish all your boasted powers. 5th. The proposed colony will certainly advance the prosperity of our country, and probably save it from destruction. The truth of this proposition is deducible from the foregoing facts and observations. Who does not dread the horrors of a servile war? Jefferson has said, “I tremble for my country when I reflect that God is just, and that his justice cannot sleep forever. The Deity knows no attribute that can take sides with us in such a contest.” Let us then improve the auspicious moment and forward the plan of colonization. 1st. A fertile and salubrious territory can be procured, at a moderate expense, on the western coast of Africa, uniting every possible advantage. This proposition can be fully demonstrated by extracts from the most authentic writers. For the sake of brevity, we shall content ourselves, with giving the result of their enquiries, and for further information on this subject we refer to the several annual reports of the American Colonization Society. On the Bagoo river, opposite the Island of Sherbro, it is contemplated to locate the colony. This country is healthy, fertile, well watered, and agreeably interspersed with hills and vallies, luxuriant meadows covered with perpetual verdure, productive uplands, and lofty mountains. The Bagroo has four fathoms water, which is amply sufficient for the purposes of foreign commerce; and the country adjacent will admit of a profitable inland navigation. Its production consist chiefly of rice, corn, cassada, yams, sweet potatoes, bananas, plantains, cocoa nuts, limes and oranges, coffee, indigo and cotton; besides a variety of medicinal roots, and plants, and woods, barks, and leaves for colouring. Domestic fowls are quite numerous. Fish, also, are said to be numerous and of a good quality. The animals used for food consist of deer, buffaloes, sheep, goats, oxen, wild hogs and fowls. The soil is admirably adapted to the cultivation of sugar, and every species of tropical produce. Some estimate may be formed of the fertility and productions of the Bagroo country by adverting to those of Sierra Leone, which is but a small colony, and inferior to our proposed settlement in every respect; yet Governor M’Carthy thinks it might in a few years produce a sufficiency of rice for the supply of all the British Islands in the West Indies. A statement published in the 2d annual report of the American Colonization Society, of the exports for one year from Sierra Leone, will throw additional light on the subject now under consideration. This delightful region, so favourable to agriculture, commerce and manufactures, like the rest of tropical Africa, is nearly depopulated by the slave trade, which has desolated the coast, and driven the persecuted natives of the interior. Hence millions of acres are uncultivated, and may be purchased almost on our own terms. The agents of the parent Society, when in Africa, thought that the same goods which would purchase a full cargo of slaves, would exchange for lands sufficient to accommodate five or ten thousand people. Page 25 of the pamphlet… more justification of this proposed place as the right place for a colony. I’m going to jump ahead, because I think readers can get the gist of what’s being said. Ultimately, that was that they weren’t simply going to put emancipated slaves on a ship back to African, drop them off, and be done with it. There were genuine concerns for the survival of the colonists, their ability to sustain themselves, and then, the resources that could serve as key to their economic growth in the international trade market. Moving on, I think the cost might be of interest, and that is exactly what I’ll be transcribing in preparation for the next, in this series of transcriptions. ← Confederate-inspired U.S. Military Service?